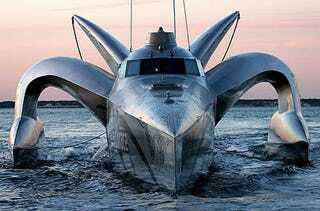 This is one radical looking trimaran, but we're still scratching our heads trying to figure out why its owner lipo-sucked his own fat to make biofuel for the 78-foot craft on his way to attempting to break a world speed record for circumnavigating the globe. Oh, now we get it. It's a publicity stunt to popularize biofuels, and now it's gone beyond the prototype stage and it's ready to roar around the world. Pete Bethune, the captain of the sleek ship EarthRace, had enough fat taken out of his body to produce about 100ml of fuel, and two of his corpulent buddies have contributed some of their own personal lard, where the resulting 10 liters of fat will be enough to help the boat travel about seven miles.